The Federal Reserve (or "The Fed") hiked rates this week, but mortgage rates fell. While that might seem counterintuitive, it's actually relatively common and fairly logical. There is more than one type of interest rate. Some are fixed. Some are adjustable. Some are for long-term loans while others only apply to overnight loans. The average consumer has little use for an overnight loan, but in the banking world, they're essential. Short and long-term rates don't have much of an effect on each other. That said, things that make longer-term rates move higher can indirectly result in short-term rates moving higher. Longer-term rates move higher for a few key reasons: faster economic growth, higher inflation, and increased supply in the bond market (i.e. government borrowing more money). Two of those three reasons (growth and inflation) are closely considered by the Fed. The Fed Funds Rate (the thing people are talking about when they say "the Fed hiked rates") is strictly an overnight rate. The Fed moves its rate higher if it wants to tap the brakes on economic growth and rising inflation. It does this to promote financial stability or, simply put, to level out the peaks and valleys in boom/bust cycles. The catch is that the Fed only meets to raise (or cut) rates 8 times a year. Moreover, they're taking a gradual approach at the moment and have clearly communicated their intention to hike 4 times in 2018. 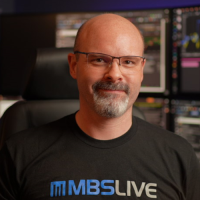 Given that the first two hikes were in March and June, the remaining two were almost certainly slated for September and December. "Almost certainly" is actually a bit of an understatement when it came to this week's hike. It had been a foregone conclusion for more than a few weeks and could only have been derailed by an unexpected catastrophe. Meanwhile, the rest of the interest rate world is free to move every day. That means longer-term rates like 10yr Treasury yields (the quintessential yard-stick by which all other longer-term rates are measured) and mortgage rates had long since adjusted to the stronger economic data and decent inflation numbers reported so far this month. Because longer-term rates had already taken their lumps, so to speak, the Fed rate hike had no ill effects. It was merely getting caught up with the rest of the interest rate world. All of the above accounts for why longer-term rates weren't forced HIGHER by the Fed, but it doesn't explain why rates moved LOWER. Longer-term rates often get in a slightly overly-defensive position ahead of Fed rate hikes and then calm down modestly after the hike actually happens. To put the improvement in perspective, consider that 10yr yields only fell from recent highs of 3.10% on Tuesday to 3.05% by Friday afternoon. 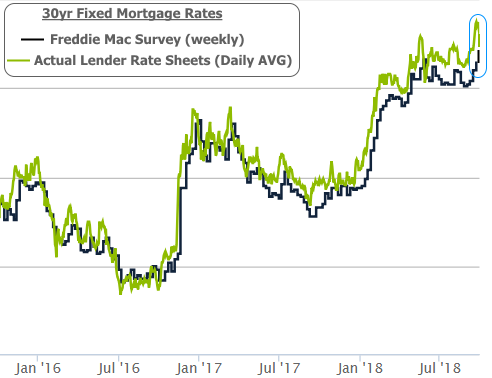 Mortgage rates fared slightly better, with some lenders nearly an eighth of a percentage point better compared to their recent highs. The notion that mortgage rates fell this week might run counter to other headlines you've seen. That has to do with the news media's reliance on Freddie Mac's weekly survey-based mortgage rate report. Freddie's numbers are fine in the long run, but they only really capture Monday/Tuesday movement. Indeed, rates stunk on Tuesday and have moved lower since then. As such, Freddie is just now getting caught up with the long-term highs I told you about last week, while this week's rates were most certainly lower by Thursday and Friday. The mortgage and housing markets need all the help they can get at the moment, depending on your point of view. Refinance activity is definitely depressed in light of the rate situation. 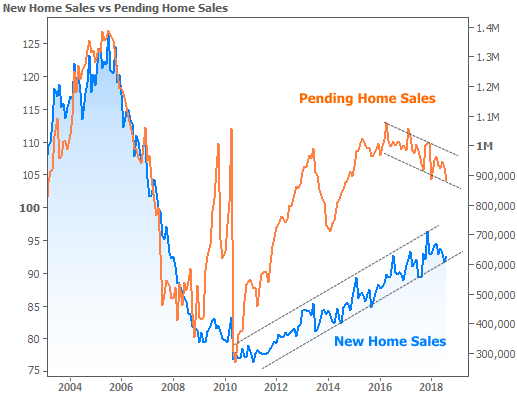 The pressure is even being felt in the purchase market, but as the following chart suggests, New Home Sales have been faring better compared to Pending Home Sales (which include existing homes). Both were updated this week, with Pending Sales continuing to slide and purchases holding steady. Despite the leveling-off in home sales numbers, price growth has yet to take significant damage. 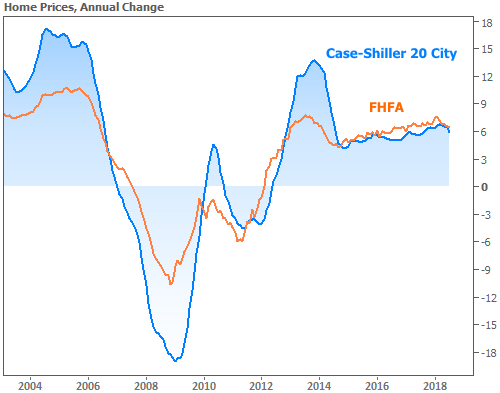 Both the Case-Shiller and FHFA price indices were updated this week. If it seems like price growth is staying stronger than your local experience suggests, keep in mind that there is a fair amount of lag in home price data (these reports cover July). Next week brings several important economic reports. Investors are more anxious than normal to see Friday's big jobs report. It was the same data that arguably kicked off the bad times for rates in early September (due to the wage growth component). If wages remain strong in next week's data, rates could quickly face renewed pressure. On the other hand, if wages fall, and especially if last month's data is revised lower, rates could easily add to the fledgling recovery seen over the past 3 days.